Florida 437, Orange County 437 and Lake County 437 travel 18 miles overall from Ocoee to Apopka and Sorrento. The state maintained portion overlays Florida 438 along a 0.106-mile section of Ocoee-Apopka Road west of the Ocoee city center. The overlap is marked in each direction. North from the eastern turn of SR 438 onto Silver Star Road, Ocoee-Apopka Road is CR 437, though signs are posted infrequently. Ocoee-Apopka Road parallels the tolled Western Beltway (SR 429) through north Ocoee to unincorporated Paradise Heights and Binion Road in south Apopka. CR 437A extends Ocoee-Apopka Road northward toward Downtown Apopka while CR 437 shifts west onto Binion Road to Magnolia Park on Lake Apopka and west Apopka to U.S. 441 (Orange Blossom Trail) at Plymouth. An implied overlap dog legs CR 437 east along Orange Blossom Trail (OBT) by the Apopka Expressway (SR 414 & 429) to Plymouth Sorrento Road. North of U.S. 441 (OBT), CR 437 (Plymouth Sorrento Road) follows a somewhat linear course just east of Wekiva Parkway (SR 429) over low rolling hills and remaining rural areas of northwest Orange County to the Lake County line. CR 437 passes under the tolled Wekiva Parkway with no direct access just south of Lake County. Plymouth Sorrento Road otherwise bee lines north to Florida 46. The county road resumes north from Florida 46 through varying rural and suburban areas three miles to Florida 44 and 4.8 miles to CR 44A. Franklin Street (unsigned CR 439) north at the south end of SR 437 (Ocoee Apopka Road) and the turn of SR 438 west onto Franklin Street in central Ocoee. Photo taken 10/20/18. The realignment of West Road to meet Ocoee Crown Point Parkway directly at Ocoee-Apopka Road (Orange County 437) was completed in May 2008. Photo taken 05/14/08. County Road 437 (Ocoee-Apopka Road) leads south from West Road toward the Ocoee city center and north along Lake Apopka to Paradise Heights. The former alignment of West Road here was subsequently demolished and repurposed for a drug store. Photo taken 05/14/08. Maintained by Orange County, Magnolia Park lines the eastern shore of Lake Apopka along CR 437 (Binion Road). Photos taken 02/18/08. An old State Roads Department (SRD) monument located at Magnolia Park along CR 437 (Binion Road). Photos taken 02/18/08. Ponkan Road eastbound passes under Wekiva Parkway (SR 429) and next intersects Plymouth Sorrento Road (CR 437). Photo taken 02/27/16. The intersection of Kelly Park Road and CR 437 (Plymouth Sorrento Road) was improved to handle traffic from the temporary north end of Wekiva Parkway (SR 429). Wekiva Parkway opened north to Kelly Park Road on July 27, 2017. Photos taken 09/03/17. 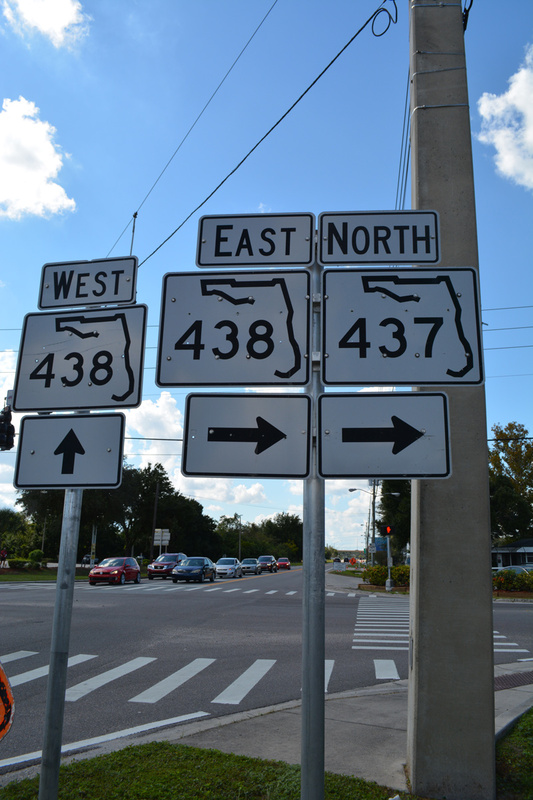 County Road 437 runs south parallel to Wekiva Parkway back to U.S. 441 in Apopka. Northward toward Sorrento, CR 437 passes under SR 429 at the systems interchange with SR 453 (Mt. Dora Connector). Photo taken 03/31/18.